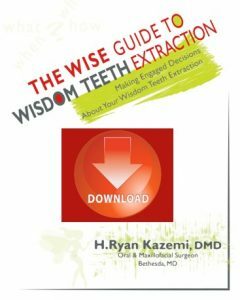 To achieve predictable results for wisdom teeth extractions, it is necessary for the oral surgeon to utilize the appropriate diagnostic tools and methods specific to the planned procedure. For wisdom teeth extractions, this diagnostic tool is the panoramic X-ray (Panorex). Regular dental X-rays (periapical or bitewing) are inadequate for wisdom teeth because they do not provide the surgeon with a complete picture. Standard dental X-rays have a limited field of view and, therefore, rarely show the wisdom teeth in their entirety. A panoramic X-ray, on the other hand, provides a complete view of the jaw and teeth. The Panorex shows the teeth and roots and their stages of development. It also shows their relationship to adjacent teeth, sinuses, and nerve canals. The Panorex enables surgeons to diagnose accurately, plan and safely treat wisdom teeth extractions. In patients with deeply impacted wisdom teeth, or when there is evidence of oral pathologies, such as jaw cysts, a dental CT scan may be recommended in addition to the Panorex. This helps the oral surgeon further to assess the position of the teeth, the size of related defects, and the proximity of vital structures, such as sinuses or nerves. Knowing teeth may change position or undergo pathological changes, it is imperative to take the Panorex within six months before the procedure this ensures a quality diagnostic work up and predictable surgery results. Operations based on a non-diagnostic X-ray can lead to many complications and poor results. This entry was posted in Oral Health News, Teeth Extraction, Wisdom Teeth. Bookmark the permalink.